Assuming your child is five years old and you start putting $250 a month in a savings account earning 2%, in 13 years you’d have $44,497.41 to pay for their college. Anticipating that isn’t going to be enough, you’d have to save $500 a month to end up with $88,995. Household debt balances were largely flat in the second quarter of this year, according to the Federal Reserve Bank of New York’s Household Debt and Credit Report. Total indebtedness increased just $2 billion from Q1 2015. Foreclosures hit their lowest point in the 16-year history of the New York Fed’s Consumer Credit Panel, a nationally representative sample drawn from anonymized Equifax credit data. Auto loan originations reached a 10-year high in the second quarter, at $119 billion, supporting a $38 billion increase in the aggregate auto loan balance, which has now passed $1 trillion. The increase in auto loans also drove most of the $67 billion increase in non-housing debt balances. Credit card balances increased, by $19 billion, to $703 billion, while student loan balances remained flat. Mortgage balances and HELOC dropped by $55 billion and $11 billion, respectively. There were $466 billion in new mortgage originations in the second quarter. Two new charts introduced in this quarter’s report show that just under half of the Q2 strength in originations were driven by borrowers with credit scores over 780. By contrast, only 8 percent ($38 billion) of all new mortgages were originated by borrowers with credit scores below 660. Fierce competition can occur when buying or selling a home because each party wants to get the “best deal” possible. When the buyer and seller are not equally matched, and they rarely are, it is important to have a champion on your side to fight for your cause. While the pace of home-buying activities picks up around the nation, certain areas are seeing more excitement than others. As is usually the case during economic recoveries, no two cities recover in exactly the same way. Some have a glut of inventory that will take many years to turn over, and other markets such as New York City, Denver and San Francisco have barely any inventory left at all, and each new listing seems to spark a vicious bidding war that drives the price far beyond a property’s appraised value. Seattle falls in the latter category. DeBord, who is also the state director of Seattle King County REALTORS®, says that institutional investors often bid the most aggressively and get the higher-priced deals; however, it’s the so-called “regular” buyer—the one who will actually move into and live in the property for at least a few years—who comprises each side of a typical Seattle bidding war. 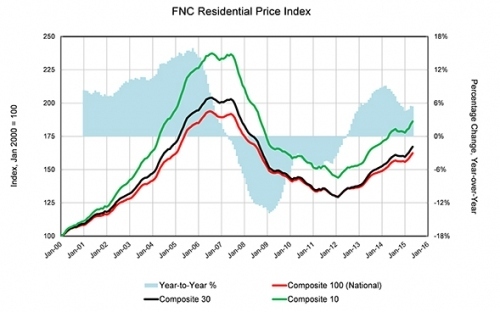 In a sign that the U.S. housing market is on track for a strong spring/summer buying season, home prices continue to show solid gains in May, according to the latest FNC Residential Price Index™ (RPI). Prices across the country climbed 1.2 percent following an upwardly-revised April, which saw the largest March-to-April seasonal gain since 2005. With homes selling at rapid pace, supply in many local markets remains relatively challenged amid rising sales. "While the participation of first-time home buyers has reportedly reached record highs, rising demand from potential trade-up buyers has also contributed importantly to the price growth in many markets,” says Bob Dorsey, FNC's chief data and analytics officer. "Trade-up buyers continue to capture moderate to modest gains on their investment; in May 2015, realized home price appreciation, measured at an annualized rate, averages 2.6 percent across the country." Foreclosure sales have dropped to their lowest levels since October 2007. In May 2015, completed final sales of foreclosed and REO properties comprised about 10.3 percent of total existing home sales, a decline of nearly two percentage points from April's 12.2 percent. Average time-on-market drops rapidly, down to 85 days in June, compared to 96 days in May. Meanwhile, sellers are taking smaller cuts off their asking price, averaging 3.1 percent in May, compared to April's 3.6 percent. Preliminary June estimates show a continued drop in the asking price discount nationwide, with buyers in the San Francisco market bidding up prices to pay an average of 4.8 percent above the listing price. If there was a magic formula for selling real estate quickly and easily, you can bet every real estate agent would be signing up. Real estate sales affect agents, buyers and sellers one way or another. Although homes need to be in good condition and offer what buyers are currently seeking, ultimately the real estate agent drives the sales. To stay on top of their game and work a little magic, smart agents have learned that a home warranty, also called a home protection plan, can work miracles for increasing sales and quick turnarounds. Learn how agents, sellers and buyers benefit from home warranties and all come out winners. Home warranty programs are available for purchase by consumers who want protection for home appliances and major home systems in the event they fail or break down. If any of the items under warranty in the program should fail, the consumer simply contacts the home warranty company and they see to it that the item is inspected, repaired or replaced by a qualified contractor. Once a real estate agent learns about the advantages of home warranty programs, work takes on new meaning and they see the possibilities for success. Skeptical buyers are no longer afraid to consider older homes when sellers pay for a home warranty. After an agent explains that the warranty covers appliances and major heating, electrical and cooling systems, clients become eager to see a home that was once not considered. The agent just got a shot at another sale!